The Global Volcanism Program has no activity reports for Vakinankaratra. The Global Volcanism Program has no Weekly Reports available for Vakinankaratra. The Global Volcanism Program has no Bulletin Reports available for Vakinankaratra. The Quaternary Vakinankaratra volcanic field at the SW end of the Neogene Ankaratra volcanic field. 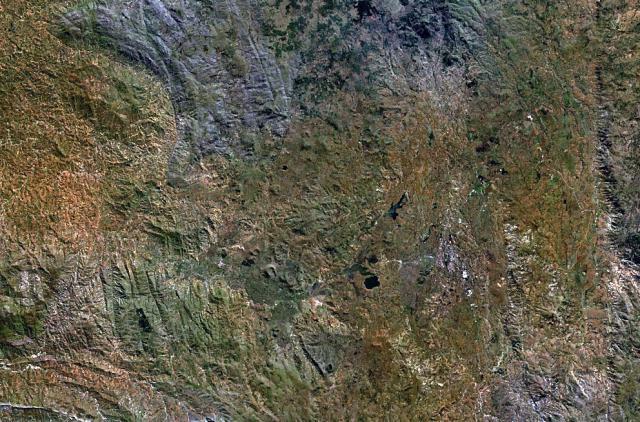 The larger field covers a 100-km-long area in central Madagascar generally between Avironimamo to the N and Antsirabe to the S. Trachytic lava domes were erupted during the initial stage, and massive fissure eruptions created a series of tectonic lakes. The latest activity produced well-preserved basanitic cinder cones. Vulcanian eruptions formed several lake-filled craters. Battistini R, 1962. Le massif volcanique de l'Itasy (Madagascar). Annales Geog, 384: 167-178. The Global Volcanism Program is not aware of any Holocene eruptions from Vakinankaratra. If this volcano has had large eruptions (VEI >= 4) prior to 10,000 years ago, information might be found on the Vakinankaratra page in the LaMEVE (Large Magnitude Explosive Volcanic Eruptions) database, a part of the Volcano Global Risk Identification and Analysis Project (VOGRIPA). There is no Deformation History data available for Vakinankaratra. There is no Emissions History data available for Vakinankaratra. The Ankaratra volcanic field in central Madagascar consists of trachytic lava domes, fissure vents, basanitic cinder cones, and maars. The volcanic field is one of the largest on the island and covers a 100-km-long area in central Madagascar. Hot springs occur at Ranomafana. North is to the top in this NASA Landsat image. The Global Volcanism Program has no maps available for Vakinankaratra. There are no samples for Vakinankaratra in the Smithsonian's NMNH Department of Mineral Sciences Rock and Ore collection. Large Eruptions of Vakinankaratra Information about large Quaternary eruptions (VEI >= 4) is cataloged in the Large Magnitude Explosive Volcanic Eruptions (LaMEVE) database of the Volcano Global Risk Identification and Analysis Project (VOGRIPA).